Frank Barnes applied for a Seaman’s Protection Certificate in August 1917. American seamen carried the document as proof of citizenship in foreign ports. Per his application, Barnes was born 22 January 1895 in Wilson, North Carolina; was not literate; and had been employed since 1915 as a fireman on the S.S. Mauretania en route from New York to France. Howard Adams, above, and William Smith and Fredrick Woods, below, gave affidavits to establish Barnes’ identification. The customs collector testified to Barnes’ citizenship. 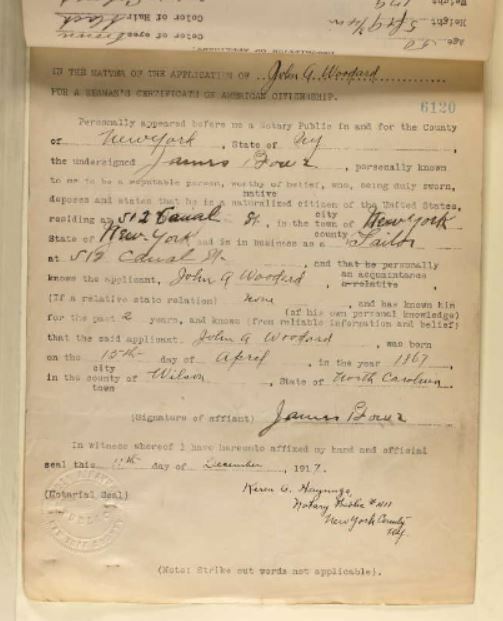 In December 1917, Frank Barnes himself attested that he was born in Wilson in 1894 and that his father Frank Barnes “(probably)” or “believes he was born in” the United States. Barnes had lived in Wilson until 1915 when he began to work in shipping. He had recently worked on three ships: the S.S. Orduna from 1 July to 19 July 1917; the S.S. Carmenia from 26 August to 11 September 1917; and the S.S. Anglo Saxon, 14 November to 14 December 1917. Barnes received his identification in December 1917 in Bordeaux, France. U.S. 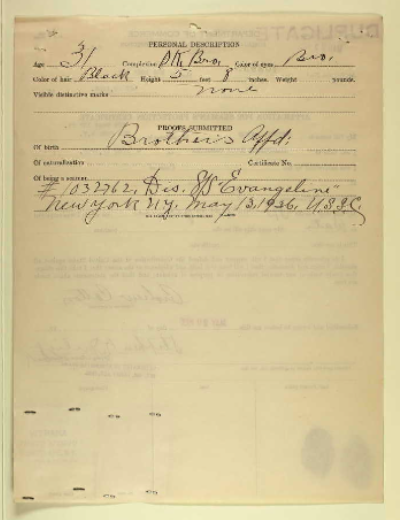 Applications for Seaman’s Protection Certificates, 1916-1940 [database on-line], http://www.ancestry.com; original document at Application for Seaman’s Protection Certificates, 1916-1940, Records of the Bureau of Marine Inspection and Navigation, 1774-1982, Record Group 41, National Archives, Washington, D.C.
John A. Woodard applied for a Seaman’s Protection Certificate in December 1917. American seamen carried the document as proof of citizenship in foreign ports. 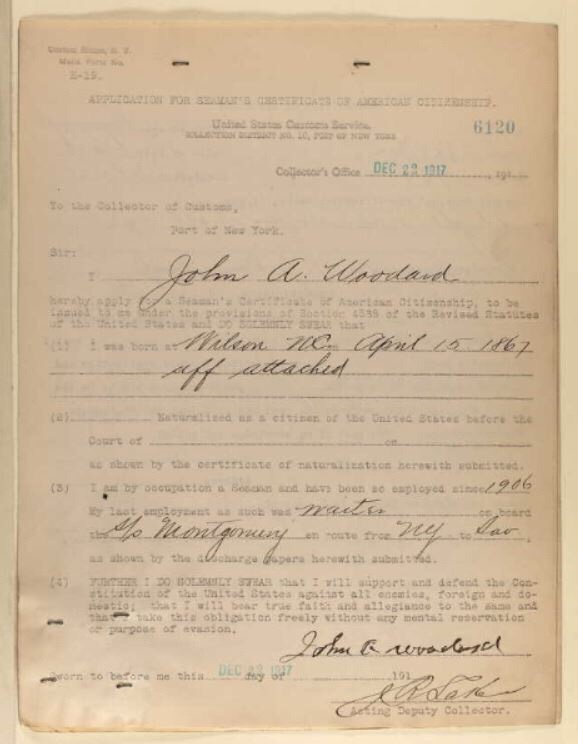 Per his application, Woodard was born 15 April 1867 in Wilson, North Carolina; resided at 512 Canal Street, New York City; had been a seaman since 1906; and had last worked as a waiter on the S.S. Montgomery en route from New York to Savannah, Georgia. He was 5’9 3/4″, 179 pounds, with colored complexion, brown eyes, and black hair and a slight scar under his right eye. Andrew Cotton applied for a Seaman’s Protection Certificate in May 1936. American seamen carried the document as proof of citizenship in foreign ports. Per his application, Cotton was born 19 June 1904 in Sharpsburg, North Carolina; resided at 207 West 137th Street, New York City; and had last worked on the S.S. Evangeline as a waiter. He was 5’8″ with dark brown skin, brown eyes and black hair and had no identifying marks. In the 1910 census of Toisnot township, Wilson County: on Levy Edwards Road, Isaac Cotton, 44; wife Flonnie, 34; and children Coloneous, 18, Lucy, 16, Sidney, 13, Mary, 11, Isaac E., 8, Andrew, 6, Levy, 4, and Clarence, 1. Passenger lists from 1938 to 1954 show Cotton shipping out of ports on both sides of the Atlantic, including New York, New York; Yarmouth, Nova Scotia; Saint Georges and Hamilton, Bermuda; Port of Spain, Trinidad and Tobago; Hamburg, Germany; Gourock, Scotland; Southampton, England; Cobh, Ireland; and Genoa, Italy. U.S. 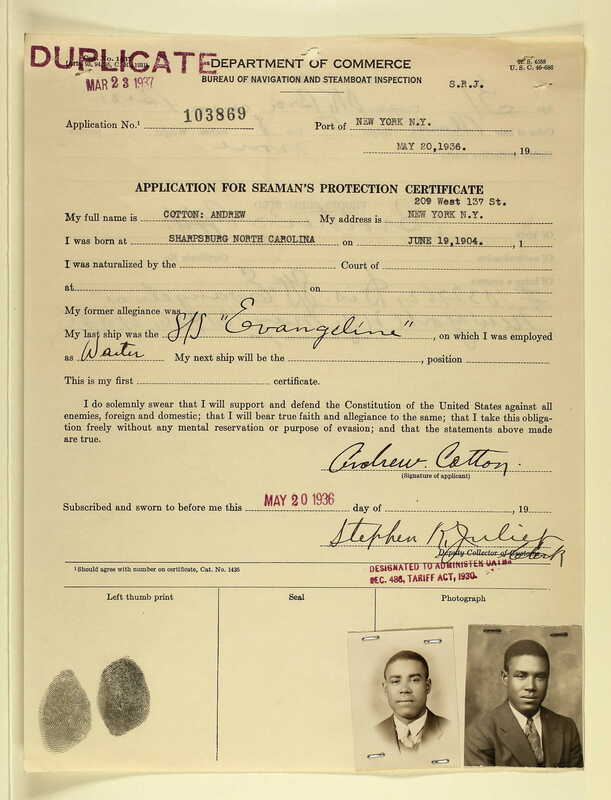 Applications for Seaman’s Protection Certificates, 1916-1940 [database on-line], http://www.ancestry.com; original document at Application for Seaman’s Protection Certificates, 1916-1940, Records of the Bureau of Marine Inspection and Navigation, 1774-1982, Record Group 41, National Archives, Washington, D.C; New York Passenger Lists, 1820-1957 [database on-line], http://www.ancestry.com.